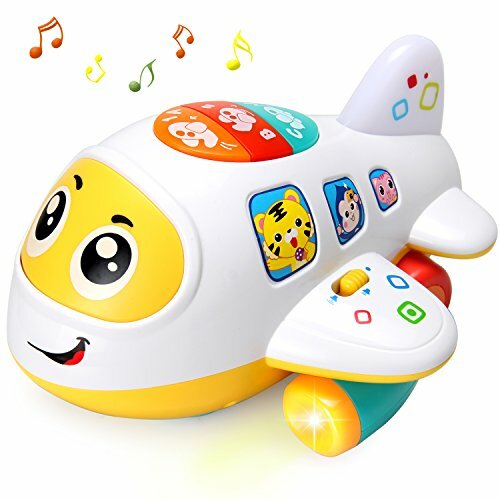 It is A Fun & Safe Airplane Toy Set for Toddlers,Boys and Girls.Make the Best Gifts! Babies 12M+ are lively and full of curious to the world.They always like to explore the unknow surrounding by faltering steps. 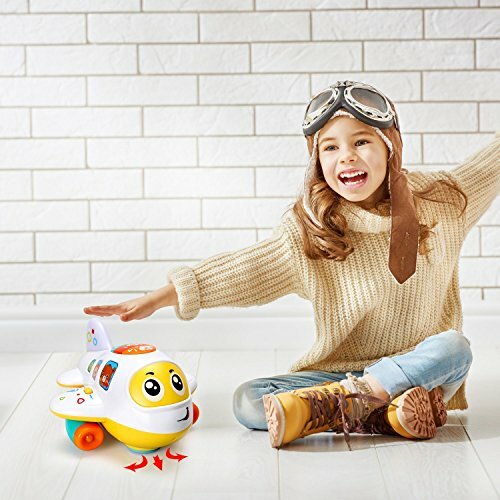 This sturdy,colorful,eco-friendly aircraft plane fun toy is constructed entirely from recycled materials,safe for them.Kids of all ages love to fly it and push it! Electric airplane toys play music while walking,the unique ligh andrealistic sound effecs attract baby to play,to walk. And it also can play letters”ABC”or number”123″,setting up the connection of voice and graphics for toddlers.Trigger more fun! Ready for take-off here we go!Start,Decelerate and Stop,Free to control! These airiplane activities toys are ready for action! Kids can play with them at home or they can take them in airplanes or cars which keep them entertained while travelling which makes for a much better trip for everyone! A great plan! 100% Satisfaction Guaranteed! 6 Months Warranty! 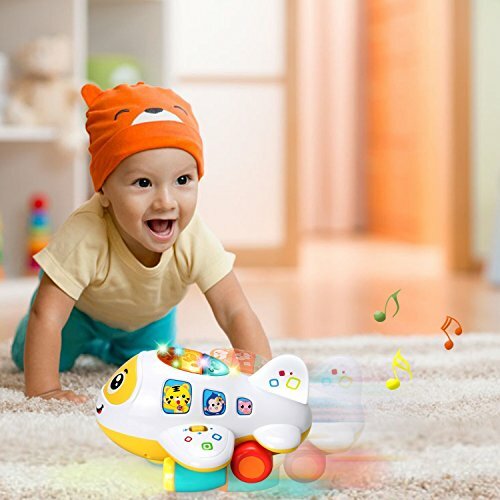 ✈LEARNING & MUSIC MODE:It will play letters”ABC”or the number”123″ while pressing corresponding button,easy for baby to learn the letter and number,setting up the connection of voice and graphics. Playingng engine sound effects and universal movement. walking slowly or stop immediately,showing the vividly process of flight,while pressing the start button. 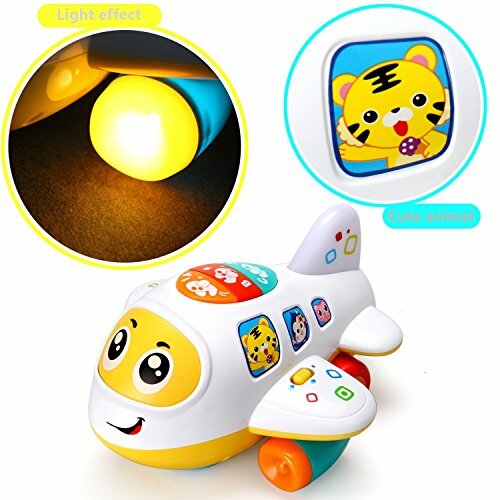 ✈REALISTIC SOUND EFFECT AND COLORFUL LIGHT:Aircraft start,flight,deceleration or stop will play a realistic sound effect.Encourage baby to be learn the knowledge of the airplane.When press its body button ,the light of aerofoil and empennage will flash. 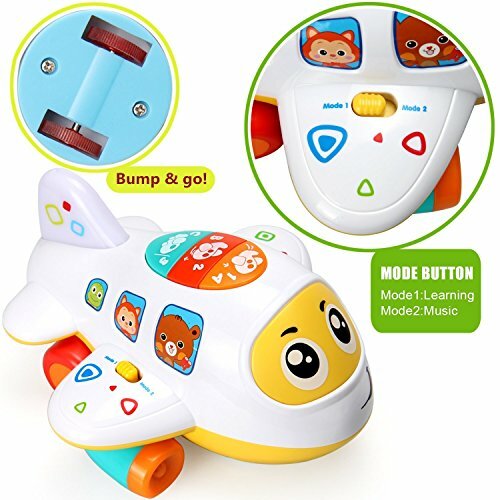 ✈UNIVERSAL MOVEMENT:In the music mode,when baby press the start button,the airplane will play engine sound effect and universal moveme.In the meantime,it will play cheerful music to attract baby to walk to chase full of fun,creating a colorful and cheerful atmosphere! 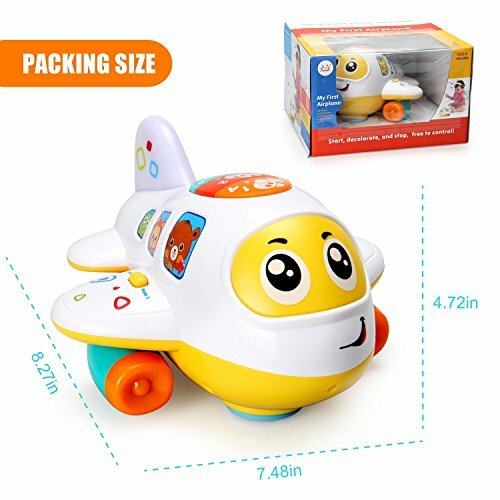 ✈DIVERSIFIED EARLY EDUCATION CONTENT:By chasing the airplane game,drive the baby to walk.Learn numbers,letters and relevant shape,the knowledge of the airplane while playing.All of these are good for cultivating baby’s imagination,cognitive and action decelopment.